This book comes highly recommended by a retired children's librarian who checked it out from the public library to read to her almost 2 year old grandson. She read it and read it and read it...if you know what I mean. Then, being a dutiful librarian she returned it to the library on time and that's where the trouble started. "Where's Gator, Gator, Gator" asked her grandson. Another retired children's librarian who reads to her three year old grandson gave her the tip from experience. You always reserve the book your grandchild loves a few days before you return it, so when you return the copy you have, the computer will tell the customer service person that you are next on the list (hopefully) and the book can go back home with you! Notes from a tea party attended by four retired Children's librarians. Do you wanna? Wanna see? Let’s go find that gator, gator, gator! Put on your life jacket, hop in the boat, and raise your binoculars—it’s time to go on an adventure! 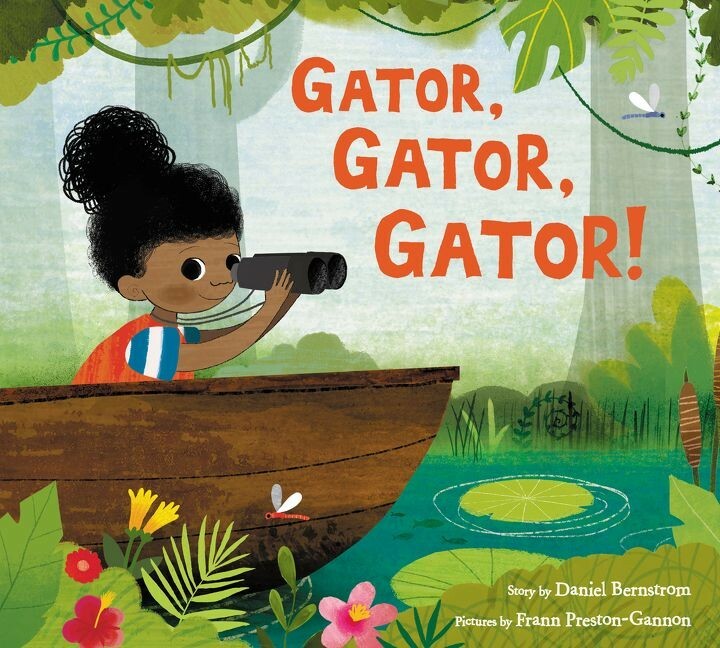 In Daniel Bernstrom’s follow-up to the critically acclaimed One Day in the Eucalyptus, Eucalyptus Tree, a fearless little girl takes off in search of a giant gator—but she’s not going into that swamp alone! No way! She wants YOU, the reader, to come along. Off you go, peering through the lush landscapes, looking for that gator! But each time you think you see it? Oops! Just a fox. Or some ducks! Or a snake. Maybe you’ll never find the gator, gator, gator . . .